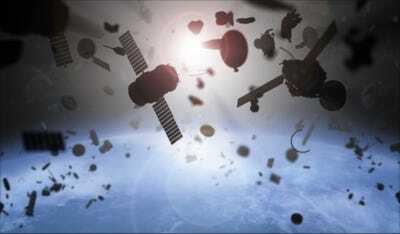 ShutterstockAn illustration of a runaway space junk event called the Kessler syndrome. A falling Chinese space station dubbed Tiangong-1, or “Heavenly Palace,” is about to break up into pieces in the atmosphere and crash to Earth. It will likely go down this weekend. Experts say it is nearly impossible to determine the exact time and location of the crash. The 9.4-ton spacecraft potentially contains large amounts of hydrazine, a toxic, flammable chemical that is very dangerous to humans. But debris from Tiangong-1 is extremely unlikely to hit people. In 2011, China launched a space station called Tiangong-1 but lost control of it five years later, due to an apparent malfunction that ended communications with the craft. The 9.4-ton station is now on the verge of breaking up in the atmosphere, with the debris crashing to Earth this weekend. While scientists say pieces of Tiangong-1 are extremely unlikely to hit people, the station may contain a toxic, flammable chemical called hydrazine. The colorless and volatile liquid, used in Tiangong-1’s engine for fuel, is dangerous to humans. Emitting an ammonia-like odor, hydrazine can poison the blood, kidneys, lungs, and the central nervous system. It can also severely burn skin and damage the eyes, nose, and mouth, among other things. ESAA map of Tiangong-1’s potential re-entry area. The chances of Tiangong-1’s re-entry are slightly higher in New Zealand, Tasmania, the northern states of the US, northern China, the Middle East, central Italy, northern Spain, and parts of South America and southern Africa. The degree to which the Earth’s atmosphere will burn up the craft is also still unclear, but scientists predict that some pieces will survive. The chunks could sprinkle over a long, thin area of up to 1,000 miles. The best-case scenario would be that Tiangong-1 lands in the sea, which is statistically more likely than it hitting land, since oceans take up 70% of Earth. If it crashes into water, there would be less of a chance of a curious human hunting for the debris and coming into contact with hydrazine.